Reluctant readers, and avid readers, will really like this book. Charlie Joe Jackson will do anything to avoid reading! 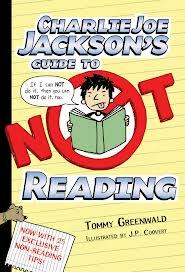 Narrated by middle schooler Charlie Joe, it reads a little like a journal, with funny tips throughout about how to avoid reading. But here’s the surprise (at least it was to me)-Charlie Joe is likable, the story has substance, and the characters are believable. I highly recommend this book to upper elementary and middle school kids, whether they’re reluctant or avid readers. I can’t wait to read the second one! This entry was posted in Humor, Realistic and tagged boys, friends, girls, humor, middle school, relationships, school. Bookmark the permalink.